People were packed in to the West Villages' Bottom Line on a wet wintry night during this year's NYC Winter Jazzfest as the John Irabagon Trio took a commanding stand on stage. Between the saxophonist's confident and resourceful melodies, Barry Altshul's inventive and precise drumming, and Mark Helias' sturdy support, the group had the audience captivated throughout its fierce 45 minute set. It Takes All Kinds captures the same trio at the Peitz Festival in Germany last year, and the recording captures all the energy and focus of this powerful group. Like on the blast of energy of Irabagon's Foxy, he again demonstrates an endless stream of ideas while spinning off melodic tangents with gusto. The music is often playful and energetic like on the muscular ‘Vestiges,’ but also deep and tense, like on the track ‘Elusive’ where Helias’ bowing adds some drama to the exotic melody and fragile pulse. 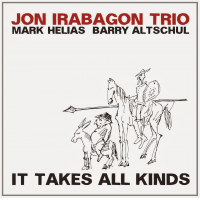 Working with Helias and Altschul, Irabagon picks up with a rhythm section with history and experience. Their work together on Altschul's Irina with John Surman and Enrico Rava is a bright spot in my record collection. It Takes All Kinds is an excellent document of this dynamic duo fronted by the vigorous saxophonist.